Virginia Gov. 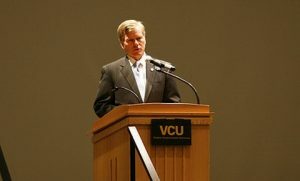 Bob McDonnell‘s proposed budget for 2012 through 2014 would have a net spending increase of $211.4 million over the current two-year $80 billion budget, WTOP reports. Among the increases listed in the report, the largest is a $128.2 million deposit into the state’s rainy day fund, including a $50 million option over the minimal requirement. The next-largest increase listed is a $114.6 million allocation for increased use of Medicaid and inflation costs. McDonnell declined an optional expansion of the state’s Medicaid program under the Affordable Care Act, the report said. According to the Virginian-Pilot, McDonnell also wants a larger amount of the state’s 5-cent sales tax to go into an account used for road maintenance. He is proposing a transportation funding package worth $500 million total, the newspaper reports.